This is part one of a two part recipe. 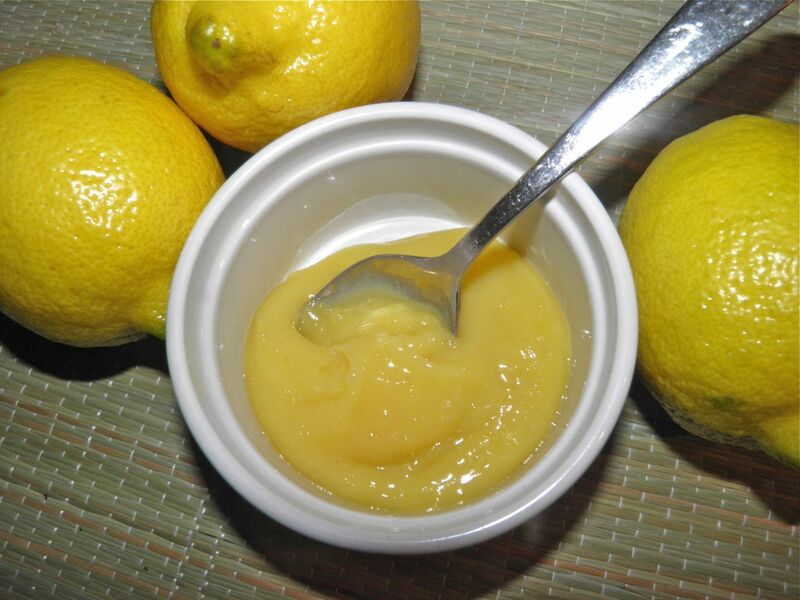 This post is how to make delicious lemon curd. Today I will be making a lemon curd pull-apart sweet loaf. I’ll be posting that tomorrow. You don't have to make both recipes. Lemon curd can be used on its own in many, many wonderful ways. Lemon curd is not pie filling. If you wish, you can easily turn this recipe into an awe-inspiring pie filling by the addition of cornstarch (about 3 tbsp mixed with a little water). It's awe-inspiring because it's so much more lemony than regular pie filling. This post is for the sweet classic dessert topping, thick and lemony – but not solid. Curd can be made from many different fruits, citrus such as lime, tangerine, grapefruit, berries like raspberry, blackberry and cranberry, and even exotics like passion fruit or mango. Basically they’re all mixtures of sugar, butter, juice, zest and eggs (or just yolks) that is slow cooked until thickened. The curd sets up more as it cools but is never supposed to be a complete solid like lemon pie filling. In Victorian times homemade curd was served with bread, crumpets and scones alongside jams or jellies. It was never meant to be stored for long periods so only the amount that could be used in several days was made at home. This was also the period of time where lemon meringue pie came into vogue in the USA and England. Interesting fact: the first recorded recipe for lemon meringue pie was by a Swiss chef named Alexander Frehse in the 1800s. Stable meringue wasn't figured out itself until the 1700s. Today store-purchased curd (which I think is a little thicker than homemade) can be kept for longer periods. Of course it is also full of preservatives and other thickening agents. 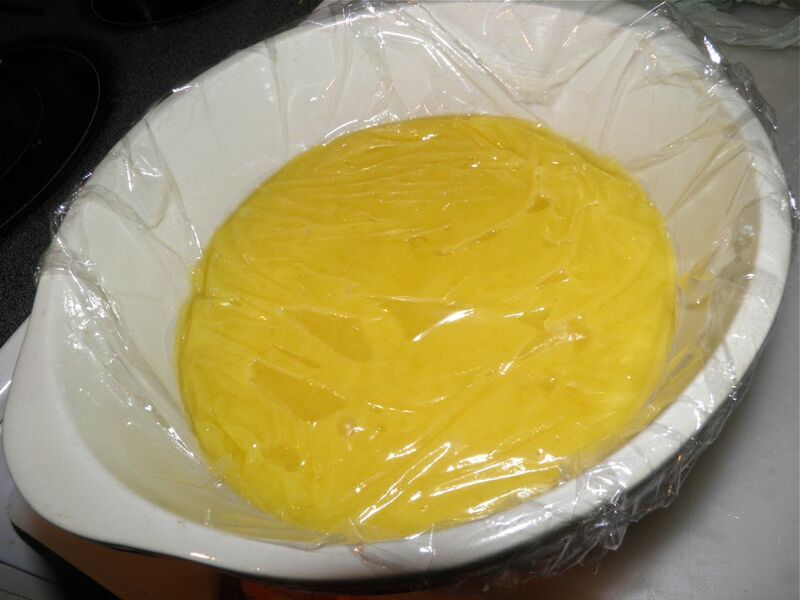 Lemon curd is different than lemon pie filling in that the amount of juice is higher in curd. This makes them thinner but far more intense. Since curd contains butter it has a richer “mouthfeel” than pie filling. Most pie fillings have no butter and rely on cornstarch to thicken them. Here’s an interesting lemon fact for you, for any lemon use. Did you know that you can get about half again as much juice out of a lemon if you microwave it for 30 seconds? Try it. It works! It’s certainly handy to know when making lemonade where a lot of lemons are called for. Most times lemons are not cheap. Here in Nova Scotia we usually have to pay between 70-80¢ each, if not more. This last week our local Sobeys had bags of lemons (about 14-16 fruit/5lbs) for $3.79. How could I pass that up? Once eggs are in, put on the stove. So this is one way to use some, although it only uses 4 (and the juice of 3). 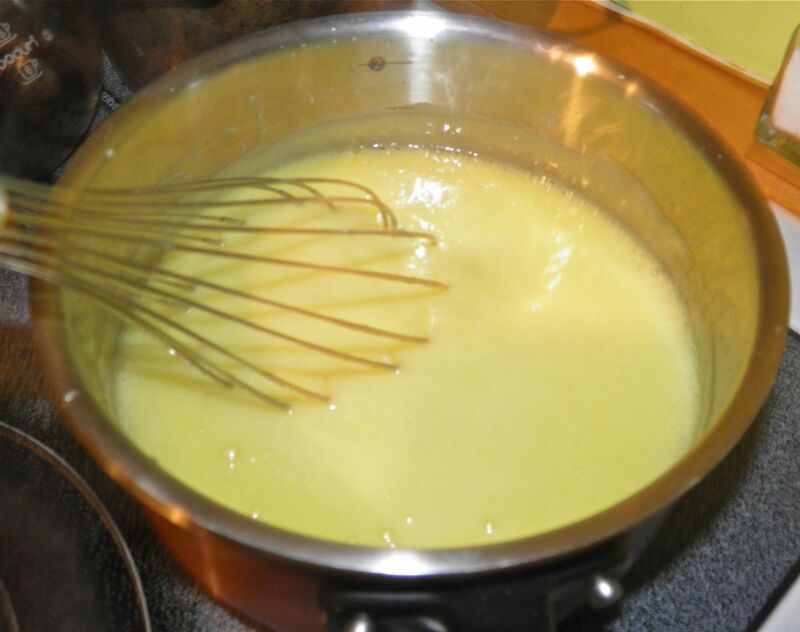 Some recipes to make lemon curd call for using your food processor, mixer and then a double boiler. I’ve simplified the process. I didn’t have to dirty my mixer and I didn’t use a double boiler. 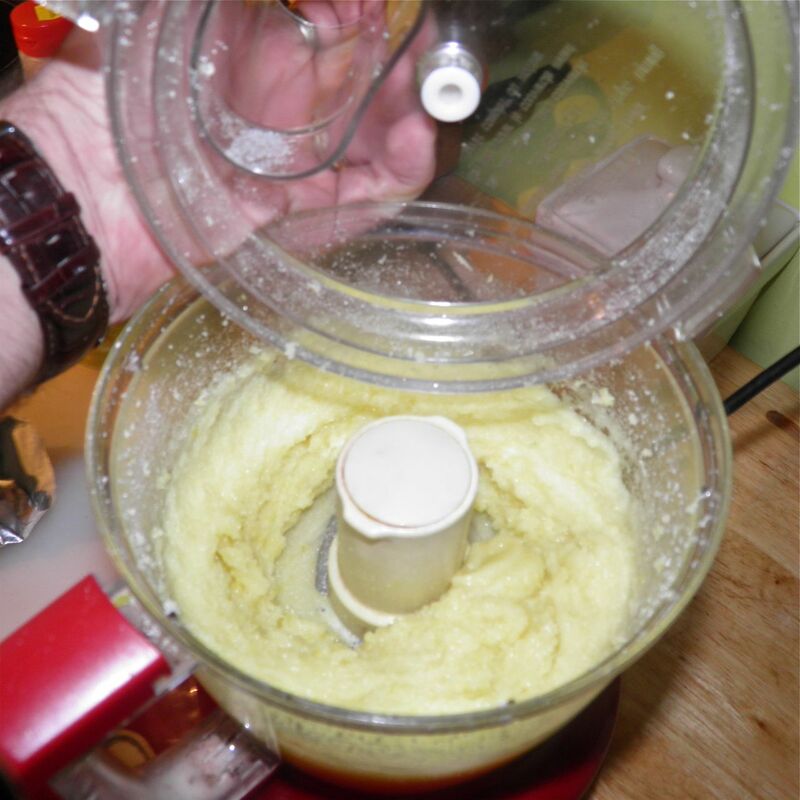 The entire prep for this curd is done in a food processor. No great pile of dishes to wash. If you’re looking for an intense lemony experience, make this curd. It’s great. Later this morning I’ll be using it to stuff a wonderful sweet dessert pastry. Come back to see how I did! prevent a skim. If you put your curd in a jar I wouldn't worry. Wash and then zest the lemons with a grater. Try not to get any of the white pith because it will make your curd bitter. 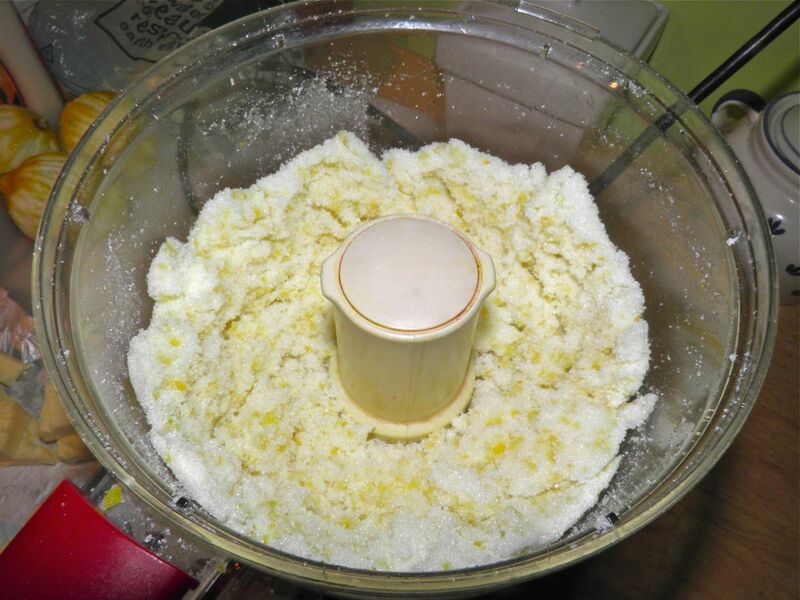 Place the sugar and zest in a food processor and let it chop i=until the zest is very small and well incorporated into the sugar. With the motor running, slowly add the butter, one piece at a time. let it run until well incorporated in the sugar. Then add in the lemon juice and purée until smooth. Then quickly incorporate the eggs with the motor running, one at a time. Immediately transfer the mixture to a pot. If you dilly dally you risk the chance of “burning” the eggs with the sugar/lemon. Turn the heat to high and cook, whisking constantly, until the mixture barely comes to a boil. Then reduce the heat to medium high and cook for 3-5 minutes minutes until trails are left in the curd by the whisk. The mixture will look and feel thick under the whisk. It will set up more when cooled. At this stage you can strain the mixture if you wish. I did not because of how I was going to use it. I wanted the bits of rind. You can also pour the curd into individual serving dishes. Just top with a little whipped cream, or be really decadent and top with a little sugar and run under the broiler like a crème brulée. Just remember, this is soft curd, not firm.